Last week I has the pleasure of speaking with Jordan Sams from Zappos about his experience in helping the company transition to Holacracy. Jordan began working at Zappos as part of the customer service team. He worked for years with the goal of being a manager and shortly after being promoted into that role, an email went out to the entire company. The email explained that not only was Jordan’s role being eliminated, but every other role in the company was going away too. Rather than taking the severance package and moving on to new opportunities, Jordan chose to stick around and move to a different part of the company where he could still provide value. Let’s take a look at the Zappos Holacracy transition, and see how folks like Jordan fit in. Jordan made the analogy that traditional management is like high school. In most places, there is very little autonomy. Employees work in specifically structured teams on work that was delegated to them by their manager, which was probably delegated to that person from another manager higher up in the pyramid. In general, an employees life is very structured and decision making is left to those in higher pay grades. Self-organizing companies are more like college. There is a clear goal for each person, but personal freedom, choice, and judgement are valued. Rather than having decisions made, and tasks delegated, employees in self-organizing companies make decisions based on their own experience and values. Zappos removed not just the managers role, but every other role, too. Jordan and I had a good laugh about this. When I asked what his current title was, Jordan had to explain that, although no one internally has an official title, they do have external titles. Titles that are used to ease the conversation when people like me call. For example, Tony Hsies has the title of CEO outside of the company, and Jordan identifies as part of the Holacracy implementations team. Internally though, they are just people with skill sets. Which brings up an interesting question: if there are no internal titles, how do you find someone at Zappos when you need a person with a specific skill set? For example, how would a development team find a performance tester, if there is no one with the title of performance engineer? Their current solution is a product called GlassFrog. Zappos documents every employee in this product along with some information about that persons skill set. Want to find a MongoDB specialist at Zappos? You’ll have to run a query in GlassFish. Jordan is currently on the Holacracy Implementations Team. That means that he mostly spends his time teaching 3 day courses to help people learn about the new structure and also to go through simulations of what day to day life in a self-organizing company is like. 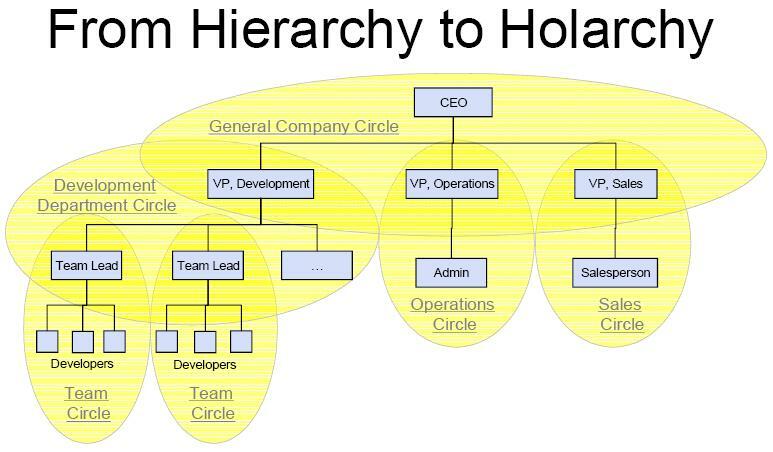 A typical class begins by spending some time on the Holacracy Constitution. The value system can be found there as well as rules of engagement like how teams for and interact, how roles are created and assigned, and how meetings should be run. This is the framework for how a Holocratic company would run. After the academic introduction, attendees participate in exercises that simulate how meetings and conflict resolution work in a Holacracy, there is some explanation on what what it means to be a self-organizing company, and then there is a Q&A time period where attendees ask specific questions based on their experience. Since the transition has already begun, many people have already spent some time in the new structure. The Q&A time is valuable for them since they have had time to develop meaningful questions. There are also workshops on special topics. Jordan explained that Holacracy is like a set of training wheels that helps organizations get to a state where teams self-organize. It is an initial set of rules to help in the transition. Jordan’s role in this transition is expected to last about 11 months. We talked about that and he mentioned that at that point, he felt the skills he developed while managing the customer services team, and while teaching classes during this transition would make him a valuable asset somewhere else in the company. Next week, I’ll talk about the required reading for everyone that decided to stick around. I'm curious to see how this will play out in the future. I read that the founder of holacracy, Brian Robertson, said it would take a company like Zappos (size-wise) a few years to get through the learning stage. Does Jordan see it that way? Jordan didn't really mention how long he thought an entire roll out would take. Although he mentioned the holacracy framework was like training wheels for companies to become self-organizing, I don't see how this could ever be considered 'done'. This is culture shift in every sense, and I imagine that once they get to where they thought they should be in the beginning, they should have discovered something new to tweak and make more efficient.